I'm a 41-year-old professional puzzlemaker who lives in Boca Raton, Florida. I've been with my partner Brian for seven years. I love puzzles, games, and mental pursuits of all kinds. Tell us about your very first published crossword. It was called "Shining Examples", in the November 1983 Games Magazine; I was 14 when the puzzle was accepted, and had just turned 15 when it was published. It was a one-star 15x15 repeated-word theme with 80 words, but Mike Shenk accepted it because the three 15-letter entries crossed two 11-letter entries. He had to rework several sections of the grid, and of course changed a lot of clues. I still have the contract for that puzzle; I earned $40 for it, which was a great rate at the time. Where do you publish regularly nowadays? Every Monday through Friday, I have the Yahoo Daily Puzzle with Hints; it's a 13x13 pop-culture-based puzzle where you can click on any clue to see the Yahoo search results, which should lead you to the answer. Every week, I have the "wordoku" puzzle in TV Guide magazine, where there is a long TV-related word or phrase somewhere in the completed puzzle. Every five weeks, I have a themeless puzzle in the Washington Post, edited by Peter Gordon. I try to put up one puzzle a month on Triple Play Puzzles, my website. I usually put out a book or two with Sterling Publishing every year. Tip-Top Criss-Crosses will be published next, and I'm about to start work on Pop Culture Word Searches. I try to find time to make occasional puzzles for the New York Times, the Chronicle of Higher Education, and other places, but I don't get to do too much of that. I have a couple more very exciting new gigs possibly in the works, but nothing is certain yet. Given how prolifically you publish puzzles you seem to construct almost as fast as you solve! How long does it take you to construct one of your regular puzzles, and what's the secret to such rapid turnaround? Really depends on the puzzle, of course. I typically spend two weeks a month making 20 Yahoo puzzles; a puzzle for the Post or the Times might take a few days. I don't actually think I'm that prolific, aside from Yahoo — I have relatively few puzzles published in the "major" markets every year, compared to many constructors. If a regular solver was to attempt one of your puzzles (published anonymously), how might they recognize it as a 'Trip Payne' puzzle? I'm not sure that I have a distinctive style, like (say) Karen Tracey or Byron Walden or Bob Klahn. I think my puzzles have a lot in common with people like Mike Shenk and Patrick Berry, though I'm not necessarily claiming to be in their league. I focus on trying to find the cleanest possible fill, and I spend a lot of time on the clues. Since I construct by hand (I'm so old-school that I still use grid paper), my fills probably betray a slight bias toward my own interests; that's a problem that computer-filled puzzles don't have. But I can live with that. What books/websites/software are your constant companions when you're constructing a crossword puzzle? If I need to look up a pattern, I use the databases at Cruciverb, the NPL site, and Onelook. There are tons of sites I use regularly — Wikipedia, IMDB, and so on. I have a large library of reference books that were very handy in the pre-Internet days but don't get pulled out nearly as often anymore. Who are your mentors in the world of crossword construction? Primarily Mike Shenk and Stanley Newman. Will Shortz gave my career a boost by allowing me to work at Games as an intern during my college breaks. Aside from Mike, the constructors I most admired when I was coming into my own as a puzzlemaker were Henry Hook, Merl Reagle, and Jordan Lasher. When did you realize that you might be 'faster than the average bear' at this game? It wasn't like it was some sudden discovery, like a superhero discovering that he has superpowers for the first time. I entered a Baltimore crossword tournament in 1987, came in at the top of the bottom half, and realized that I had a long way to go to be as good as people like David Rosen or Ellen Ripstein or John McNeill. So I solved a lot of puzzles, honed my techniques, learned the vocab, and started working my way up the tournament ladder. When did you enter the American Crossword Puzzle Tournament (ACPT), for the first time, and how did you do? I was a judge at the ACPT for several years (and constructed a couple of puzzles for it, including the final puzzle once). I eventually asked Will if I could jump from the judging side to the solving side, which at that point no one else had done, and he agreed. So I entered in 1992 for the first time; if I'm remembering correctly, I was leading going into the final round, but ended up in third place, behind Doug and Ellen. You've won the ACPT a rather impressive three times. Is any particular one of those victories a real standout for you? They've all been special, of course. The first one was great, winning at age 24 in 1993. But I really liked my last victory, in 2004, when I set an A-finals record time of 5:20, halving the times of my competitors, Jon and Al. For some reason that puzzle was right in my wheelhouse, I can't explain why. In 2009 you came within a whisker of winning the ACPT again. Can you describe what went wrong? In 2008, I finished first but had two mistakes; I filled in INVESTS for INJECTS, which made VAN rather than JAN and ROSCO rather than ROCCO — and all the clues seemed right *enough* that I didn't question them. In 2009, freakishly, the same exact thing happened: I finished first but had two mistakes — ALL ALONE for ALKALINE (clued as "Basic"), SLATES for SKATES, and ROCARDO for RICARDO — and again, they all seemed right *enough*, given the specific clues, that the mental alarm bells never went off. The other thing that went wrong was that for those two specific years, Will changed the time limit from 15 minutes to 20 minutes, and it's entirely likely that had the time limit still been at 15 minutes, I would have taken both titles despite the errors, since Tyler didn't finish the puzzles until well after that point each year. Trip Payne, with no hesitation. I can't believe the guy has only three titles - he's right in it every year. And he has to be hungry for another title after stumbling in the final two years in a row. The big surprise, of course, is that neither of you won it. Can you describe want went wrong for you this year? 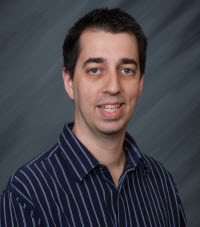 And who is this Dan Feyer guy anyway - did he come out of nowhere? To answer the last question first: hardly! Two years ago, he won the C division; last year, he won the B division and would have made the A finals had he not made a strategic error on puzzle 7. Many of us had him pegged pre-tournament as the favorite to win. Nothing really went wrong for me this year; I was just squarely beaten on puzzle 5. The only two puzzles where I wasn't in the top minute were puzzle 2 (one minute behind the leaders) and puzzle 5 (two minutes behind most of the leaders, four minutes behind Dan). For some reason, I just wasn't on Quigley's wavelength on puzzle 5, and I didn't crack it as quickly as the other top people. Just the way it goes; I'd much rather lose that way than because of a careless error or something. How do you 'prepare' for a crossword tournament? I probably prepare less than any other top solver. Since I make puzzles for a living, solving is sort of a busman's holiday, and I don't really do so on a regular basis. That said, in the month before a tournament, I'll solve maybe a few hundred puzzles — go through a couple of Reagle or Sun collections, print out some puzzles I haven't done from various sources, that sort of thing. Which crossword puzzles do you solve more or less religiously throughout the year? I always solve the Fireball and Washington Post Puzzler themelesses, and usually solve the Friday and Saturday New York Times puzzles. I also enjoy the variety puzzles Patrick Berry puts up on his site . There are a lot of puzzles where I don't solve them regularly, but when it's time for me to take a plane trip, I print out all the ones I haven't gotten to yet — the Onion, the Chronicle of Higher Education, Quigley's themelesses, and the most recent Reagles. I don't usually speed-solve, unless I'm in training or someone asks me to for a point of comparison. I either solve casually or, if I want a challenge, I cut out the across clues and try to solve the puzzle using just the downs. How often do you get seriously stumped on a puzzle nowadays - I mean, to the point where you have to cheat, or leave some squares blank? Can't remember the last time. Tell us about the work you did for the CBS show 'Million Dollar Password'? My title was "Word Expert"; during the show, my main job was to judge the legality of the clues, and determine whether a response was close enough to correct to be counted. I also helped write the rules to the game and helped vet the rounds before they aired. The first batch of episodes was taped in New York, and the second batch in Los Angeles. It was hard work but a lot of fun, and I'd love to do more game show work in the future. In 1999 you appeared on Who Wants to be a Millionaire. Can you tell us how you did? What was the final question? I was on the second and third episodes of the show, and was the first person to win $32,000. My $64,000 asked which toy's name translates into English as "play well" — Atari, Lego, Hacky Sack, or yo-yo. The answer is Lego; I guessed Atari. The question actually wasn't quite correct — "Lego" doesn't translate as anything; that's actually a morphing of a two-word Danish phrase — but I decided not to protest it, being more than happy with the money I'd won. Was Wordplay, the movie, a life-changer for you, or more just a bit of fun? It was certainly a lot of fun — how many people can say they went to film festivals to see a movie that co-starred them? And I did get some professional gigs out of it, which is always good. Very few people are experts at both Crosswords and Scrabble. How do you find the time to stay on top of both? As noted, I don't really spend much time solving crosswords. And I don't study Scrabble nearly as much as I should; that's a resolution I keep making. You once wrote that you prefer the puzzle community to the Scrabble community. Why is that? I doubt I phrased it quite that way; I don't want to seem dismissive of the Scrabble community, which I genuinely enjoy. It's just that I've been a part of the puzzle community since the mid-1980s, and most of my closest friends are in that community as well. The puzzle world is my second family, the same way many other people feel about the Scrabble community. You've expressed a bit of frustration with your Scrabble game in the past. How is it going for you right now? Right now, pretty well. I've gained around 200 rating points in the last year and am back among the top 50 players at the moment. I feel like I'm playing pretty well; I just need to keep learning words. Some serious Scrabble players would avoid crosswords for fear of filling their head with phoneys. Is that ever an issue for you? Yeah, I know some people who quit Scrabble — or quit doing puzzles — just because of that fear. It's an occasional problem, sure. But most of the crossword repeaters are short words, and I know the Scrabble-legal short words pretty much cold, so it's not a problem as often as you might think. Where do you play Scrabble mostly? Clubs, Tournaments, Online,...? I play in a lot of local tournaments (both one-day and multi-day) and try to travel out of state to a few major tournaments a year as well. I go to the Fort Lauderdale Scrabble club most Wednesday nights, and I occasionally play some games against a strong computer program called Quackle. Do you have a well-defined study regimen? Can you share it with us, or is it top secret? It's not much of a regimen, but I do have specific areas that I'm working on. I'd rather not say, for fear of giving away what areas I'm weakest in. Who do you think is the best Scrabble player in America right now? David Gibson, probably, though you could easily argue for Dave Wiegand or any of several other people. 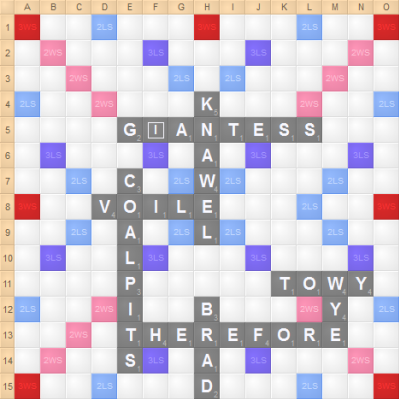 Do you have a best Scrabble play of all time? WAIT! Don't spoil it for everyone. Ok folks - what would you have played in this situation? When you have your answer, click on the board to see Trip's play. I believe you won a Big People Spelling Bee a while back. Can you tell us more about that competition? I've competed four times; I won once, in 2008. Two of my three losses were because the reader mispronounced the word. After this year's competition, many of us wrote letters to the organizers, saying that we would not return until they fixed that problem (and several other significant issues). Did you enter the Scripps National Spelling Bee when you were at school? If not, why, and if so, how did you do? No, my school didn't send anyone to the bee. I typically did well in classroom bees, though. Have you heard of the AARP Senior National Spelling Bee. Do you think when you reach that special age that starts with '5' you might give it a go? Do you think spelling bees for adults have the potential to become something really big, or is it just a bit of fun? I suspect it's just a bit of fun. I guess I'd consider something similar if it was local or had a larger prize, but I doubt I'd travel to Wyoming for a chance at possibly recouping most of my travel expenses. What are your word-buff-esque goals between now and the end of the year? I'd like to continue improving at Scrabble (I'd love to make the top 10 at Nationals this August, which I've never managed). Other than that, I'd like to just keep trying to make creative, interesting puzzles, both for Triple Play Puzzles and elsewhere. PHEW! I think that just about does it Trip. Thanks so much — I realize how much of your valuable time this has taken, but rest assured, Word-Buff visitors will thoroughly appreciate it! And don't forget, if you like reading about people, books, and handy resources from the world of Scrabble, Crosswords, and other word games, feel free to pop your name and email address in the box below.